What Is the Meaning of Roof Cladding? Insulation takes many forms and is measured by an R-value, which indicates resistance to heat or cold. Each numeric value stands for one hour. R-19 insulation is rated to resist heat or cold for 19 hours. R-30 insulation resists temperature changes for 30 hours. When insulation is added to homes and buildings, the need for energy to heat or cool them decreases, lowering energy bills. Much heat and cold comes in and leaves through the roof. The insulation value of new products depends on the thickness with which they are applied. Types of new insulation that can achieve a value of R-19 are fiberglass batts, rock wool or blanket insulation made from natural fibers. New insulation is labeled as to its effectiveness in resisting heat or cold. Outdoor sidings and roofing materials also add to the R-value, so any added insulation with an R-value of 19 will actually have a higher resistance to heat or cold penetration. Denim and paper are recycled to create insulation for homes and buildings. These products are manufactured in different weights and thicknesses. These types of insulation generally emit no hazardous gases into the environment. The materials are shredded and placed in bats or sold as loose insulation to be blown into walls and roofs. 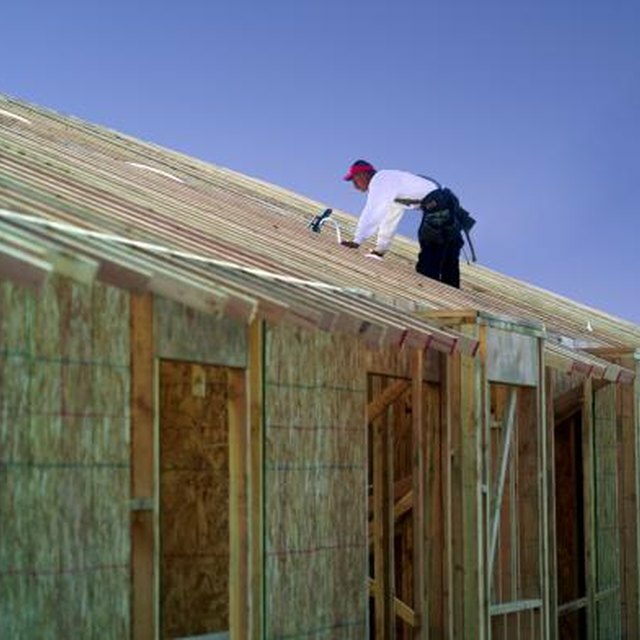 The advantage that these products have is that they use fewer natural resources and the energy to create them is often less than for other new insulation products like fiberglass. Buildings made from concrete blocks can utilize insulated blocks that have insulation built into the product. According to the US. Department of Energy, these types of insulation provide excellent thermal resistance. These blocks also have a long shelf life, since they are made from concrete with sheets of foam insulation inside. Besides new and recycled insulation, builders can wrap buildings with reflective foil or sheets of foam insulation that includes a reflective backing to bring the building up to the R-19 specification. The Energy Star program of the federal Environmental Protection Agency (EPA) recommends that homes have insulation with R-values appropriate for the climate. The EPA recommends R-values of 19 for flooring in Zones 2 and 3, generally states in the southeast and southwestern portions of the US. Wall and roof insulation levels are higher for all zones. What Is a Code 2 & 3 Mobile Home in Florida?